Numerous owners found the 996 Vioz GTX’s waterproofing beyond outstanding. Nearly everyone who bought this Zamberlan boot swore by its exceptional comfort. About half of the reviewing population gave the footwear aces for its true-to-size fit. The Zamberlan 996 Vioz GTX received praises from several users for having top-notch traction. Some testers were astounded by the boot’s flexible collar. Less than a handful of reviewers greatly admired the gear’s fantastic design. A couple of owners loved the lasting durability of the 996 Vioz GTX. This boot helped a very small number of users conquer challenging hikes with as much arch support as possible. About a handful of hikers found the boot’s ventilation quite insufficient. A tiny fraction of consumer reviews called out the Zamberlan 996 Vioz GTX for lacking dependable debris protection. With its waterproofing, comfort level, and fit nothing short of excellent, the Zamberlan 996 Vioz GTX is hard not to like. Add to those good points the boot’s superbly grippy outsole, and wearers would have virtually no reason to skip on it—except, perhaps, its alleged lack of breathability which some users whose feet sweat a lot might utterly dislike. Overall, the 996 Vioz GTX doesn’t mess around with its set of positive qualities. That said, those who are very particular with ample ventilation in their footwear might benefit from getting a completely different boot. Every single piece of this boot is just phenomenal. [T]he build is really nice. So far the best boots I've owned. A gear designed for both function and style is the Zamberlan 996 Vioz GTX. Its full-grain leather shell provides ample terrain protection, while its Gore-tex lining offers adequate waterproofing. 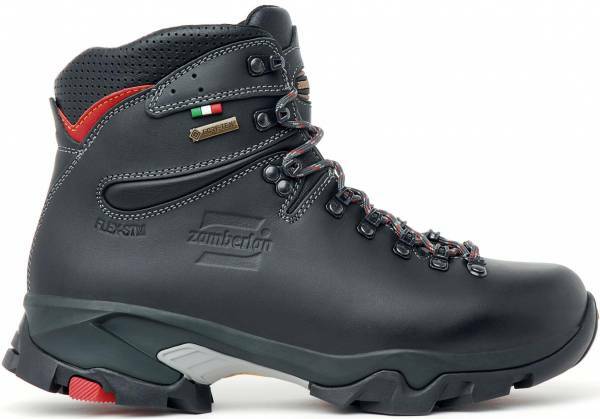 This boot is engineered with the Zamberlan Flex System. It allows wearers to pull off forward flex maneuvers comfortably while getting a steady dose of lateral support. The sole unit features a toe rocker that allows a smooth forward motion. Responsible for delivering traction is the Vibram 3D outsole. Cushioning is brought by a low-density PU wedge midsole. The Zamberlan 996 Vioz GTX is a mid-cut backpacking boot for both men and women. It has a fairly true-to-size fit. The men’s version is offered in regular and wide widths, while the women’s boot comes only in regular width. Both versions are listed in a number of half and full sizes. The boot is built on the SBPK Performance Fit last which gives the toe box enough wiggle room and the heel zone a nice curve. The wide version comes with the ZWL fit which adds extra space around the forefoot zone. The boot’s lacing system provides a custom lockdown. Equipped with a Zamberlan-exclusive Vibram 3D outsole, the 996 Vioz GTX grants wearers the ability to gain a secure footing over treacherous terrain and downhill braking. Its heavy-duty lugs are aggressively shaped to give users multi-directional traction. It is resolable which means it can be replaced with a new one when certain preconditions are met. Stabilizing the wearer’s footing and providing underfoot comfort at the same time is the 996 Vioz GTX’s low-density polyurethane wedge (moderately raised heel) midsole. It comes with a TPU shank to improve the gear’s overall stability. Additional cushioning is provided by the boot’s 4-mm thick Flex insole. The 996 Vioz GTX has a smooth full-grain leather upper treated with Hydrobloc—a Zamberlan cream-based product that enhances the water resistance of leather boots. The main interior of the upper is imbued with Gore-Tex’s Performance Comfort technology, giving the leather boot proper protection from intrusive water. The collar, on the other hand, is crafted with Microtex linings for moisture management around the ankle area. Round laces and combination eyelets complete this boot’s svelte upper. The laces are synthetic, while the eyelets are metallic.